Place the toaster oven rack to the lowest position in the oven. Preheat the oven to 400°F on the convection setting. Remove giblets and neck from cavity of chicken, reserve for another use or discard. Rinse chicken with cold water and pat dry. Place a baking rack into the broiling pan (that is lined with foil) add 1/4 cup water to the pan and lightly spray the baking rack with cooking spray. Tuck the wings under and place the chicken on the baking rack pan. Clean work surface and hands with soap and hot water before continuing. Combine the salt and pepper. Rub half the mixture in the cavity of the chicken; then place the herb sprig(s), garlic halves, onion quarters and lemon zest in the cavity of the chicken. Loosely tie the legs together. Rub the chicken with the olive oil and remaining salt and pepper. Drizzle with the lemon juice. 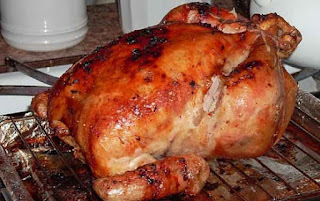 Place the chicken in the oven and roast at 400°F for 20 minutes, then lower the temperature to 375°F and continue to roast for an additional 12 minutes per pound longer. Considering my chicken was 5 lbs. I will roast it for 60 minutes. You will have to calculate the time according to your chicken's weight by multiplying 12 minutes times the size per pound of your chicken. Turn off oven and remove the chicken to a platter. Let stand 10 - 15 minutes before carving . Enjoy it ! Chicken cooked like this turned out really good. Made gravy by pouring the juices into a sauce pot, sprinkling flour in with water and whisked until boiling and thick. We had left-over mashed potatoes to pour the gravy over and added a side of mixed veges. Dinner good enough for Sunday and company.